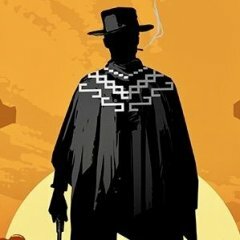 I personally think the biggest mistake new shooters interested in getting into CAS make, especially those that have shot other disciplines, is to go out and purchase cowboy guns without doing research. By research I mean not just reading the Wire and other places, but more importantly trying out weapons before spending a bunch of money on guns that don’t work well for CAS, or for you, and later having to sell at a loss to buy something that works better for you. The first thing interested newcomers to CAS should do is GO TO SOME MATCHES before buying any guns or equipment. Watch a few matches and after each match talk with some of the shooters. I bet 99% of the time someone will be putting guns in your hand for you to try. Try as many of the guns as you can before deciding to purchase any gun. If you have inherited some guns or already own some, talk with the other shooters to get their input about whether or not these guns will work well for CAS. Some will, some won't. Never say never to reloading. Sooner or later if you really get into CAS shooting, you'll be reloading. Before purchasing guns, clothes, leather or reloading equipment, check the Wire for used clothing, leather goods, and equipment. Get recommendations from several shooters that reload. If possible, try out a friend's reloading equipment if he/she will let you. Bottom line is GO TO SOME MATCHES, meet the friendliest people in the world, and be prepared to have FUN, FUN, FUN. I always say-'Try before you buy'. A lot of good advice there. If I had gotten that advice before I went out buying I would not own the pistols, rifle or shotgun I have today. This does not mean one’s taste won’t change and new guns will not be bought. What I like to shoot others may not. My gun collection has evolved and is more of a theme than a set of high speed tools. Anyways reloading is expensive enough. I could not shoot otc ammo especially in a .45. The equipment journey for cart, guns, leather, reloading, clothes and accessories is a part of the game. We might lose some newbies (sad but true) who buy what they perceive as the wrong gear but the journey 'makes' a CAS shooter with determination and grit. I also believe that there is no one set of right gear for all. The typical winners would win with lesser (but reliable) gear. 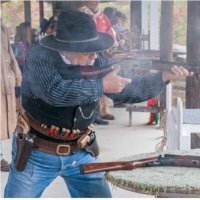 There are fast shooters with 1866/1873, Uberti Henry's, Marlins, Rossi 92s and Colt pumps. There are fast shooters with Vaqueros, Blackhawks, Colts, Colt copies and others. Equipment and gear is often blamed when reliable and consistent loads , lack of practice and the inability to play the game is more common. Funny thing is that even though I have very small hands and wear children's gloves, when I was trying out pistols, lots of people suggested birds head grips. I tried them and didn't like them at all; didn't feel I had good control of the pistols. If I hadn't tried several pistols, but just listened to experienced shooters, I might have gotten guns that I didn't like or feel comfortable with. Lorelei speaks the living truth. I have just watched a new shooter at a local club buy three different new rifles before he got one that would work for him. I think he lost about a C note on each one. If you are thinking about shooting CAS, COME TO A MATCH! Just drive up, stick your hand out to the first person you meet and say "good morning, my name is _________, I'm new here! When I started there wasn't too much of a choice out there. I had a Blackhawk in .357 (you only needed one pistol) so I bought a Winchester 94 Trapper and a Stoeger coach gun. I later added an Uberti in .357. The choices now since 1997 are mind boggling! I'd say decide on the caliber first and go from there! The only thing I started with that I still have (not using but in the gun safe) are my old model Vaqueros. If I would go back to shooting 38s, I would likely use them. I started with a rifle and shotgun that my husband had. I found out what I DIDN'T WANT that way. I have had many different guns over 19 years. Some are still in the gun safe and others were traded in. There weren't a lot of ladies shooting in my area - I'd guess maybe 10%. I also got lots of bad advice, much of which I did not take. It came from shooters and gun dealers both. The worst was the constant advice to "get her a 20 ga" it won't kick as much. Man, I couldn't get rid of that thing fast enough! 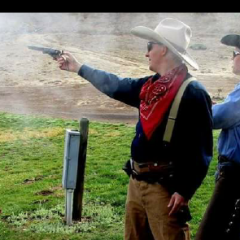 Over time we found a gun store, owned by a cowboy shooter, that cowboy targets out back so you could try things out. That was our best discovery ever and we still shop with him after all these years. Try before you buy. Seek out advice from several sources. Know what level you want to enjoy the sport at. Are you highly competitive? Are you more interested in the authentic look and feel of being a cowboy? Read over the category requirements in the SASS handbook and seek out people that shoot in the categories that catch your interest. Go out to a few matches... don't be bashful, introduce yourself and express your interest. Whether there is one or ten clubs within a reasonable, (or even unreasonable) driving distance, get out and visit all of 'em! Remember this, every single one of us started somewhere, sometime... Even the founders of the game. Be open to try out several different models of each firearm. Sure, we all have our preferences... but just as there are Fords, Chevy's & Dodges (ok, maybe a couple foreign types), in the parking lot, you're likely to find S&W's, Colts and Remingtons in the hands of various competitors... along with Winchesters, Marlins and Henrys, (not so many), and let's not even get into the different makes and models of shotguns! NO, not all side-by-sides are created equal! For each firearm you try, ASK what modifications have been done... as in - "Why is that Cimarron SO much smoother than the Taylors I just tried...?" Gee, might the Cimarron have $300 worth of action job and Taylor's, none? Makes a night and day difference in how a particular gun "feels". Ask the owner what THEY like about the gun... then ask what they DON'T like about it. Do NOT get in an uproar about the "costuming" requirements... They are much simpler than is evident from looking at long term competitors. And even that is more a reflection on how much THAT PARTICULAR competitor is "into" the costuming, than any "standard". Recognize that each person's level of enthusiasm varies significantly. And, not everyone you'll meet at any given match is a long term participant. They have shot their first match just last month... and are almost as overwhelmed as you are... maybe even more so! And for you current shooters... be observant. If there's a spectator standing around just observing... 1st, make sure they have proper safety gear on, (safety glasses and hearing protection), if not, move 'em back until you can get them some! If they do, then get over whatever embarrassment or reluctance you might have, and introduce yourself.... ask them if they have any questions... AND, if you don't happen to know the answer, guide them to someone you think might! Make yourself an Ambassador for your Club. There's only one opportunity to make a first impression. You just might be it! And if you're more of a wall-flower than your pard, nudge him/her to do the introducing... and go with 'em to observe how it's done... your pard might not be there the next time a newbie shows up! I agree....try before you buy. But you will change some equipment as you get a little better shooting this sport. I still have my original, and shoot with my 3K holster rig, 2 Old Model Vaqueros, mule eared boots, leather suspenders, homemade pants and cowboy hat. I did change from a double shotgun to a 1897 and sold my Winchester and bought a Marlin. Kind of like the carpenters saying "Measure twice, cut once." Never one to be rude, but I really think that it would proper to refer to our firearms we use in CAS as just that. Firearms! The term 'weapons' has no place here for what we are engaged in. I’m a little reserved by nature. 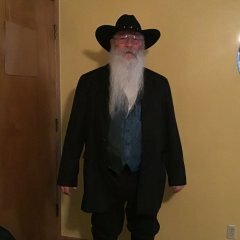 It’s way more fun to talk to folks when you’re dressed like a cowboy! hmmm... two of the four times this alternative to "Gun" or "Firearm" was used was in your post and its quoted re-post. I've got a lot of friends interested in SASS. A few have taken me up on the offer to borrow guns, gear, ammo, etc. The biggest turn offs to new shooters are reloading and the realization that almost every gun/weapon/boomstick needs to be worked on simply to have it work. Like the OP said, get out to a match first! We could do a better job of identifying guns that don't have to be worked on immediately. Most of the handguns will at least function out of the box. The new Winchester(Miroku) are literally competition ready out of the box, and Stoeger double trigger shotguns will work right away too. Why is reloading a turnoff? Reloading is not a turn off to me, but to new shooters (in my experience). You have had better luck than me when it comes to off the shelf guns. I'll play a little devil's advocate here, not that there is anything at all wrong with the very good advice folks have put in so far. But I have seen many prospective folks come out to observe matches and end up never joining because they didn't know which guns to buy, or what all needed to be done to make them run, etc. Experienced folks constantly telling them that they need to spend X amount of money on this brand gear or that type of gun or they will end up frustrated and spending more in the long run. It becomes quite overwhelming to some folks. Now I have also seen folks go out and buy all the "wrong" gear to get in the gun and indeed get frustrated. But as of yet, I haven't seen any of those folks quit. Rather they end up buying better stuff and selling the other stuff, but they stayed in the game. So while there is merit in the try before you buy mantra, just playing the game now with what you can play with, even if frustrating at the time, it's still a really fun game with the best folks around. The addiction doesn't wear off with bad gear. It just forces you to shop around for stuff more to your liking at a later time. I know I spent a lot of money trying to find guns that felt as close to real Colts as possible, only to end up with Colts in the end. I don't have any regrets getting to that point, as the alternative would have been waiting even longer to play. The only regrets I have is that I didn't discover this game much earlier. If you are new and not a shooter try not to get stuck picking up brass. Possy duties are a big part of SASS but don't feel obligated to do them unless you are shooting. Oh and remember the SASS Wire forum ain't like a monthly match. You get to meet the nicest people and get beat by people older than your grandparents. I was wondering why reloading is a turnoff to new shooters. Any idea why? 1. A pair of Uberti's. They were stiff, but worked. 2. Rossi 92, would only feed .357's, but worked. 3. Stoeger double 12ga. Again stiff as heck, but worked. Now Vaquero's are pricey, but do function. EMF Piettas are excellent right out of the box. Now, it's hard to find a Rossi 92', but the Miroku Winchester's are quite excellent right out of the box. Can still get Stoeger's pretty easy and while stiff will work. Experienced folks constantly telling them that they need to spend X amount of money on this brand gear or that type of gun or they will end up frustrated and spending more in the long run. It becomes quite overwhelming to some folks. . This is where we get lost in the weeds and where prospects get overwhelmed, and then on top of that we tell them that they “have” to reload. That’s a lot to wrap your head around all at once while you are trying to learn a new game and be safe at the same time. While I agree with encouraging new shooters to come out and try this whole notion that doing this will shortcut the process of discovery is a false economy for them. Cowboy shooting is a process, not an event. We need to encourage each new shooter’s process and not try to shortcut their experience with ours. My opinion on the matter is that if you've never reloaded before, the prospect can be daunting. Going into it, if the adage you have to reload to play the game comes into it, then it looks like another chore, added to a game you aren't really sure about in the first place. If you live in an apartment, or a small house without extra work space, reloading also might not be a feasible option. Not every shooter lives on a farm with hundreds of acres of open space and a shooting range in their back yard. And when folks say you have to reload, that's simply not true. While it is economically a much better option, I do shoot with folks that don't reload. At $25 or less a box of ammo, so $50 a shoot, one weekend a month, you'd have to shoot almost a year just to buy a base dillon. Then there's all of the ad on gear, components, etc. Then you have to factor in the time. For some folks, they have more money than time. I live in the bay area, where wages are quite a bit higher than in most places, but also working hours for many folks. Plus kids, etc. Now instead what I will tell folks is that reloading isn't necessary, but it will save you money in the long run. But more importantly, it's an addition to the rest of the game and a really relaxing hobby. Once you start playing, it's hard to think about anything else but your next shoot. Reloading helps temper that desire in a way by still letting you think about it and be productive at the same time. Some people prefer to meditate, or pray, or watch television to relax and de-stress. I like reloading. I think that perspective goes over better with folks on the fence than telling them you have to do something in order to play. As someone who hasn't yet committed to reloading, IMHO it isn't a turnoff as much as it's another cost investment into the sport. 1. The cost of purchasing those firearms along with a holster(s), gun belt, shot shell belt, apparel, etc. 2. The unknown factor of whether they will continue with the sport once they make that initial investment. As for the firearms you started with.... I agree with your choices. I think CAS may finally be the sport that makes me take the jump tho - 45lc just does not come cheap! Over the years we have seen many Dillons come up for sale by shooters that were upgrading, leaving the sport, or had passed away. Often these deals are scooped up by a shooter that is finally ready to reload. I also know of shooters that share reloaders/reloading. The reloader is owned by one shooter and his friend(s) visit and use it Everyone shares the cost of the supplies. It works for them. We used to find reloaded ammo at a local gun show that I used for a while until my hubby won a Dillon at a match. Woohoo! Now he has two, reloads for 3 or 4 shooters. It took a few years where we shopped around for pricing and purchased mostly reloaded ammo. We saved the brass knowing that someday we would do our own reloading. I don't push the reloading issue too much with newcomers. Every new shooter is different. One might enjoy CAS and shoot just once a month 6 or 8 months out the year while another will immediately plunge into a full schedule of shooting several times a month and possibly year round. Each will determine their need for reloading. When a shooter is ready to reload, he'll know it and will seek out the best way to do so. We just need to help them along the way with advice we gained from experience. I'll preface this with I can be... Frugal. Okay, cheap haha. That and I'm new so my experience is limited but I can at least share a newbie pov. I was one of those that followed the excellent advice of those here on The Wire regarding "do your research". I did. It took me 2 1/2 months of reading, asking and trying. My bride thought I was being too picky and manic (I can be very manic about things, especially nerdy research). I told her I'm trying to buy buy things once with the least chance of regret. I found that the Vaquero's fit my hand best and ergonomically put the site right where I need it when I draw, the 73 worked well for me and I preferred the S x S over the 97. I also moved from .45 colt to .38 / .357 for economic reasons. I love what I got and could not be more glad I did the research. If I hadn't, I'd have gone as cheap as possible (see preface above) and spent less just to eventually spend more. That and research / shopping the Wire for a while you see what moves fast. In the event I ever have to get out, my gear has good resale. To those looking to get in... From one newbie to another, I know it's hard to be patient and not run out get hardware but take the "do your research advice". As for attracting new folks... I've shared it before but my biggest hurdle was cost to play. Starting out you're going to shell out $3000 for good gear if you don't own anything (I had a hat lol). That's a decent chunk for most folks. The folks at matches helped sell me on going for it too. Not egging me on but just being really, the nicest, friendliest, helpful folks I've come across in a long while. For me, it wasn't how much I wanted to do it but how disappointed I'd be if I didn't. The answer was... well, I'm $3000 lighter in the bank haha. I don't reload yet. Reloading isn't scary or daunting to me. But, it's another $600 or more in equipment and materials (that's probably really optimistic). Until I do I'm stuck buying it. Store bought ammo is $23 for 50 ($.46 ea!). I ponied up for 1000 from Georgia Armory for $250 ($.25 ea). Not cheap but way better and it gives me lead to play, time to get gear / materials and brass to reload. $250 ain't that bad except it's on the heals of that $3000. Soooo, if you don't reload and you don't dig for the deals, after $3000 for gear it's $60 ea match for ammo and range / club fees until you do. I can see that being a turn off for the semi committed. I know once I reload it'll be around $.08 to $.13 ea. which is not much at all.